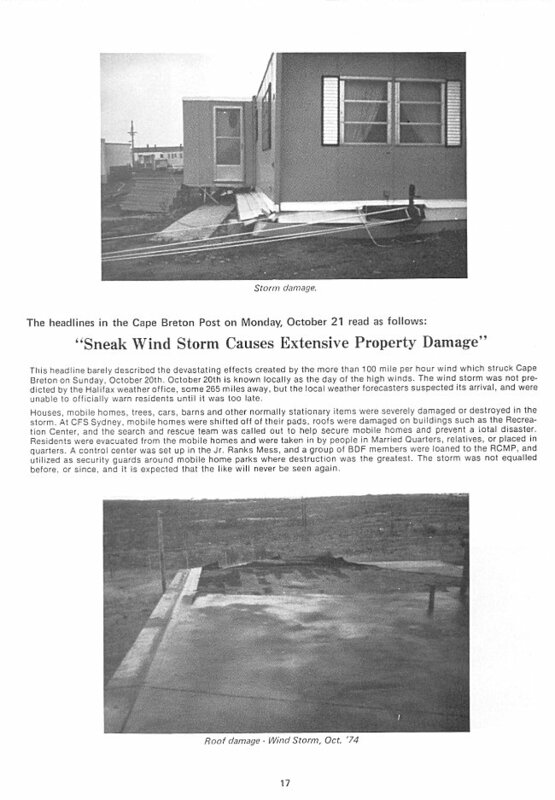 It was not unusual to experience damage at Pinetree Line radar stations due to high winds. What is unusual is the apparent lack of a compiled documentation that provides details indicating "what happened, where, and when". This file contains a summary of "significant" Pinetree Line radar station "wind damage" that is known, and documented, to have occurred in Sydney, NS. The following detail has been taken from the Narrative Reports for RCAF Station Sydney. An unseasonably heavy rainstorm in the early morning hours today caused the inundation of the Airmen's Club. Repairs to the roof were already underway, but the protective tarpaulins were no match for the deluge of rain and high winds. As a result, the Airmen's Club was temporarily closed and the NCO's dining room was forced into service as a temporary lounge for the ACs. All concerned were greatful however, that the newly remodelled bar did not suffer any damage and that the most heavily damaged parts of the Club were those which were already earmarked for early re-vamping. The tail end of hurricane "Hilda" swept through Sydney today bringing heavy rain and high winds.